Are those spots on my nose really blackheads? Those little dark dots on your nose may not be blackheads. Let’s take a look! More than lines and wrinkles, more than spots and poor texture – more than dry, oily, sensitive and any combination of complaints I may hear, “I have blackheads” is THE number 1 complaint I hear in the studio. It seems we human beings, despite whatever other skin care concerns we may have, are plagued with these pesky dark dots that like to appear, most commonly, on our noses and chins, and very inner cheeks. These little dark dots may be less or more severe depending on the individual, but for most us, they’re there. Now, as a skin therapist, I don’t care how my guests refer to these – clogged pores, blackheads, “stuff in my pores”, junk, whatever. I hear it all. What I do mind, though, is the mass market that sells to the notion of “blackheads” when often these are not blackheads at all, but instead “sebaceous filaments”. Most of the products out there that claim to resolve blackheads would never even begin to impede the existence of a true blackhead, and half the time will do very little for sebaceous filaments either. 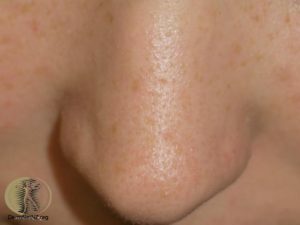 So, let’s look at a real blackhead so I can show you why all those products that claim to get rid of blackheads – don’t. Used with permission. DermNetNZ ©Professor Suhonen. See those dark plugs in the skin? THOSE are blackheads. They are large, solid masses that have formed inside a follicle. The mixture here is of skin cell protein (keratin), and oil (sebum). These are sizable impactions that come out as a solid plug, or what I often call a “kernel” as that is what they look like when extracted. True blackheads may squeeze out with pressure when extracted, but they often need assistance from tweezers to pull out the entire mass. The top of the blackhead will be the size you see at the skin’s surface, while the bottom end will be thin, light in color, and not hardened like the top. The darkness on top is the result of melanin-filled skin cells and sebum that have been oxidized by air – not dirt. Let’s say all those magical blackhead-removing products cleansed the tops off these blackheads (they won’t) – but what’s the chances they’re capable of literally pushing them up and out of the skin, freely and clearly? They can’t. The takeaway here is that what are marketed as blackhead removing products are really marketing to clogged pores/sebaceous filaments. Unless you have large, hard masses in your skin that resemble the above, you likely do not have true blackheads. Now, let’s take a look at what is probably more the case. See the tiny specks on this particular nose? These are sebaceous filaments. Feel free to call them whatever you like, but when you’ve got out that 50x beauty mirror, don’t let it lie and tell you that you have the world’s worst case of blackheads. You don’t. Promise. This nose is classic for what I see on a day to day basis. Heck, I even have sebaceous filaments on MY nose, and let me tell you – they’re there, they are never going to permanently go away, and all these trendy tools for ridding your nose of them may do more harm than good. What’s a sebaceous filament? Well, these little “holes” in our skin that we most often call pores are actually tiny, tiny hair follicles. At the bottom of that hair follicle is an oil gland. Inside that hair follicle are skin cells that shed on a daily basis. Within that tiny follicle, there’s a miniscule little hair that you’re unlikely to ever be able to see. That virtually invisible little hair acts as a wick to deliver all the aforementioned “stuff” up to the surface. What creates the darkened effect at the surface is pretty much the same as with blackhead – it’s just cells and fats that have become oxidized. It’s not dirt. It’s not that you don’t wash your face, and there’s nothing you’ll do to stop these from forming forever. In fact, in dermatology, sebaceous filaments are considered a standard, normal feature of human skin. Now that we’ve discovered what those pesky dark specks in our pores really are, we’ll go over what to do – and even more importantly – what not to do about them. Rely on pore strips. Though these can occasionally rip off the tops of little plugs in the pores, they do nothing to further purify or clarify the pores and can cause damage to your skin and leave behind more visible capillaries. Buy into those trendy rip-off masks that are circulating social media. The same downsides to pore strips apply to these painful masks. Obsess over washing your face. AM/PM cleansing is all that is necessary for almost all skin. Over exfoliate. Over exfoliation is one of the biggest problems in all aspects of healthy skin. Check with your esthetician on the appropriate form of exfoliation for your precious skin and the proper frequency of use. Fall victim to the beauty mirror. The magnified beauty mirrors are great tools for applying makeup, but please for the love of good skin – don’t post up in front of that thing and start digging, prodding, poking and picking. A) NO ONE is looking at your skin that close unless it’s your esthetician, and B) If you start looking in those mirrors for imperfections, you’ll literally never see the end of them. Walk away! Perform self-extractions. The problem here is that most of us just can’t stop. If you are red, swollen, inflamed, and standing there for more than 2 or 3 minutes – it’s too much. Angle and technique are huge for extractions, and it’s extremely difficult to do them properly on yourself. Exfoliate according to your skin care professional’s recommendations. This varies by the individual. From type of exfoliant to frequency of use, it’s super important you have a personalized exfoliation routine. Dropping countless bucks down the drain at counters on products that look pretty but aren’t ideal for your skin – just a waste of time and dollars. Get regular professional treatments. Professional extractions, done properly, do not damage skin. 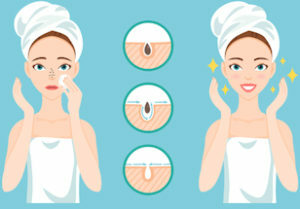 A well-trained skin therapist has the proper technique, preparation products and tools to perform safe extractions and knows when enough is enough. Be consistent. A facial twice a year will never be enough to keep pores refined and clarified. If clarified skin is truly what you want, consistency is key. Keep in mind that everyone’s skin does not follow the same timeline. In general, it is typical to expect visible plugged pores to return within about 30 days. For some, this timeline will be even shorter. This is one of the reasons we suggest monthly skin care services. Avoid pore clogging ingredients and especially coconut oil on your face. Coconut oil has become such a popular oil and is touted as a miracle cure for just about everything. Unfortunately, as healthy as it is for some to eat, it’s a 4 on a 5 point scale for being pore-clogging. My go-to treatment for cleaning out pores are Ultrasonic Facials. These are painless, non-invasive services that use ultrasonic frequency to pressure wash the skin and force debris out the of pores without causing damage. Next, skin peels. Light peels can really work to dissolve the contents of the pores and also superficially tighten the pore’s surface. This combination can be a fabulous one for reducing pore visibility and increasing clarity. It does not require super strong peels to accomplish this, so just about anyone can receive a mild peel for clarifying purposes. Although we all will likely have a true blackhead at some point or another (even if not on the face), blackheads are more associated with acneic skin conditions and must be softened and removed from the skin through a series of professional extraction services and proper home care. If you’re struggling with blackheads as a result of acne, please check out the Acne Clearing Program. I see new products hitting the social media feeds each day that promise to remove every last “blackhead” from a person’s complexion. In reality, blackheads are an entirely different skin condition, and the sebaceous filaments that consumers actually are looking to get rid of are a perfectly normal aspect of human skin. It is possible to dramatically improve the appearance of the pores, but no product will permanently remove them or tighten pores to a non-existent state. Customized home care and consistency with targeted professional services are the best way to achieve clarified skin. Woah! This is very informative! Everybody refers to the little dark hole as a blackhead. I really appreciate the photos you’ve provided as it clearly stated the difference between the two. Thank you, Sarah! Yes, it can be confusing – especially because industry marketers incorrectly reference any little speck in a pore as a blackhead. I appreciate you leaving feedback!!! I am so happy I fell onto this article. I always thought they were blackheads and tried so many pore strips and focusing cleaning on the end of my nose. But I went for a professional anti-acne facial and got so confused when they said I had no blackheads that needed extraction. I’m now wondering if I ever have actually had blackheads. Totally understandable, Kat! It would definitely be confusing if no one explained the difference to you! Probably made you feel they didn’t know what they were talking about lol. True blackheads will often feel like a hard seed in the skin and when pressure is applied, they may raise up a bit, and even be so thick and hard that you can pull them out with a tweezer, place them on a tissue and look at them! They are wayyyy different than the little sebaceous filaments most people think are blackheads. Thank you for stopping by!